CNBLUE, as an Indie band at Japan, released their third Japanese single ‘RE-MAINTENANCE’ on January 9, 2011 and kick-off with their Zepp Tour to 4 cities: Osaka, Fukuoka, Nagoya and Tokyo on January 9, 11, 13 and 16 respectively. All tickets were sold out immediately the moment it was opened for sale. The songs in ‘RE-MAINTENANCE’ album are composed and written by CNBLUE members Jung Yonghwa and Lee Jonghyun themselves. It is almost 2 weeks after CNBLUE’s RE-MAINTENANCE was released and even without official promotions, they managed to top Oricon Independent Singles Weekly Ranking and Billboard Japan Top Independent Albums and Singles . According to FNC’s President Han Seong Ho, he will choose a Japanese major record label within the first half of the year and CNBLUE is set to have a major debut at Japan this summer. This entry was posted on January 23, 2011 by redtofu. 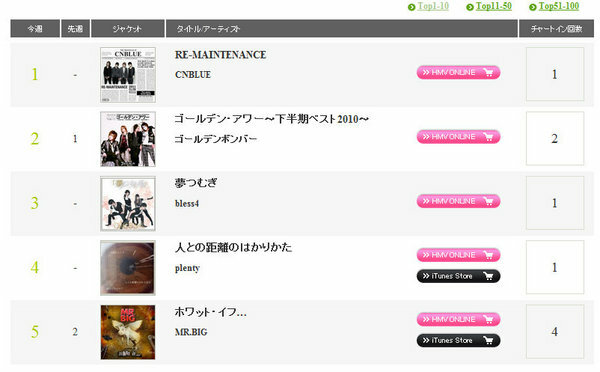 It was filed under Band, Chart, CN Blue, News and was tagged with CN Blue.